Beyond the handpawful of petty blog posts about my beefs with various service providers, CogDogBlog has stayed cleared of anything important in the world. Maybe it’s time, or the times, or advancing time, but gnawing at the back of my brain the last few weeks has been a desire to Do Something. And I have landed on solar energy. I know nothing about it really, but am awakened to the obvious fact that I live in an area of the country (Arizona) where literally most days of the year we are being rained upon (pun) by a continuous flow of free, unexploited, energy from the sun. Yet beyond what some intrepid individuals do with tapping into the sun for energy, and some experiments at the universities, as a state Arizona IMHO is missing a hue opportunity to do more than tinker at the edges for the same of feel good PR. What I have heard over the years is that the limiting facot of using solar energy are in costs of the technology. However, some recent readings indicate that the cause is really a larger root problem of the USA- the inferiority of our electrical grid. Our entire innovation infrastructure, actually everything we rely on daily for the energy that powers our homes, our computers, our HD TVs, our kitchens,,, is based on a grid designed by Edison in 1882, This was made the clear focus of articles Lifeline for Renewable Power (Feb 2009 Technology Review). The structure of the current grid system, which is as far from a smart network as one can get, actually works completely against adding renewable energy sources to the grid, because it lacks any ability to adjust to variable inputs of wind, solar, geo energy. Furthermore, the places the grid is maximized in connections are far away from the places it needs to be to use renewable sources. It is a system designed to support continued burning of coal. To make use of this clean energy, we’ll need more transmission lines that can transport power from one region to another and connect energy-Â­hungry cities with the remote areas where much of our renewable power is likely to be generated. We’ll also need far smarter controls throughout the distribution system–technologies that can store extra electricity from wind farms in the batteries of plug-in hybrid cars, for example, or remotely turn power-hungry appliances on and off as the energy supply rises and falls. If these grid upgrades don’t happen, new renewable-power projects could be stalled, because they would place unacceptable stresses on existing electrical systems. April 2009 issue of Wired Next time you send a twitter message, somewhere coal is burning to allow your breakfast update to be transmitted. Fix the Grid was also the theme to the April 2009 issue of Wired, in Power to the People: 7 Ways to Fix the Grid Now, although the comments really blast the article as “uninformed”. The so-called most innovative country in the world is shining little innovation on a sustainable energy future. Our “biggest” renewable energy appears to be biomass? burning woodchips? (I am not sure if this includes the trash burning energy plants like the one I remember in Baltimore). Burning leaves makes more energy than solar, wind, and geo-thermal combined?? That seems lame. Compare to the sources of energy in say New Zealand where coal is only 12% of the total, the biggest source is hydro electric (55%). But really- in the US we get 0.01% of our energy from solar? That is pitiful. I am seeing almost limitless untapped energy outside my windows every day. I sit at this point on just a little bit of information, and no answers, and not even sure of the questions beyond, “How can we not afford to tap into the sun?” As is suggested in my small readings so far- it is not one energy source that will be a magic bullet, but a combination of several counter-weighted by changing our patterns of consumption. So one places I am looking is a new site I came across recently, Connect2Earth which looks like an online community for the green-minded. From what I can see, they propose some themes for discussion, encourage argument/debate in the community space and select the best responses that may get the proponent involved in some international lobbying efforts. How will climate change affect your life? Will you have enough food in 50 years time? Enough energy? Do you need to learn more about environmental issues? Do you have ideas on what governments, NGOs and companies should be doing? Should you care about any of this? Every two months, we choose one of these essential environmental topics and give you the possibility to express yourself. A WWF or IUCN expert gives an overview of the issue and asks a few questions to help start the debate. You can then participate in the discussion with your comments, video or images, and help everybody get a more comprehensive understanding of the topic. Your contributions are rated by other members of the community, and top contributors get great rewards. And it looks like the current topic is in parallel with my thinking– renewable energy. Maybe I will hone some ideas for this place, maybe not. 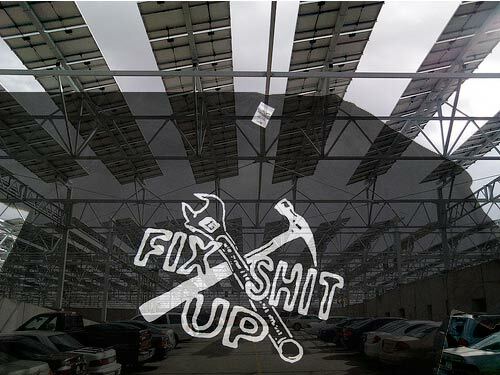 Or maybe I will be nailing solar panels to the roof. Or maybe I will just go on using up energy and doing nothing about it. Um, do you not know what hydroelectric is? It’s electricity that’s produced by building dams and tapping water as it runs downhill. It is renewable. The supply of water, typically generated by rainfall, does not disappear (there are some exceptions because of glacier melt). Neither does gravity. > Burning leaves makes more energy than solar, wind, and geo-thermal combined?? That seems lame. This is also going to include wood stoves and wood-burning furnaces and fireplaces. Lots, actually. While hydro is certainly a renewable source, living in an area where there are two large dams, and a third most likely on it’s way, some would say that hydro is not really green when you consider the huge impact on the land base. We also have some wind projects on the go here (which we have plenty of) – one on sensitive wildlife habitat. Alan, I would also like to learn more about the issues and benefits of solar, as well as geothermal. Apparently we have a couple of houses in our area the are using geothermal and I know of some remote guide outfitter camps that are using solar panels that have been recycled from other installations kind of like companies passing on older computers to schools. Stephen the designation of hydro electric as non renewable caught my eyey too, but that was defined by the DOE source where the graphic in the technology review came from. I’d agree with Gerry that while water is technically renewable and gravity is free, the negative impact of dams ( changing the natural system) is the issue. Gerry as far as geothermal goes, I font have the exact stat but recall reading while stdying in Iceland that a concerted government effort goylt them to a point where fomething like 90 % of their heat comes from geothermal sources ( it does help to be situated on an active volcanic gift zone). I don’t know what to say to this post other than “wow” – you’ve assembled a motherload of interesting stuff here, and I hope your interest persists and that you keep blogging it! Fascinating information. I live in West Virginia, where energy sources are a hotbutton topic. Part of the problem that we haven’t addressed is that too many people are making too much money from the grid the way it is. WE need to find a way to transition folks to making money from greener energy. Re-working the grid is something that may help out. I’m no engineer, but I think that we could continue to use the existing grid if we were able to create “holding stations” for the energy produced by intermittent sources. Addresses and alleviates both problems.